Remember that fun mnemonic from grade school: “Never Eat Shredded Wheat?” It’s a wonderful technique teachers use to memorize North, South, East, West. Fun, right? With all that parents are forced to remember—extracurricular activities, doctor’s appointments, school projects, dinner—shouldn’t they have something enjoyable to help them recall all that needs to be remembered? Take children’s teeth care basics for example. With all that’s required to keep kids’ teeth healthy, a perfectly-suited acronym is just what’s needed to help parents put dental essentials at the forefront of their minds: SMILE. It’s all you need to help your children achieve the best routines to promote positive oral hygiene. When It Comes to Remembering Children’s Teeth Care, Simply SMILE! Did you remember to book a six-month dental checkup? Is your child using the best toothpaste to prevent cavities? Has your preschooler brushed her teeth today? Parents and caregivers often wonder if they’re doing all they can to support best children’s teeth care practices. Don’t worry if you fall into this category. All you have to bring to your mind (or your face) is a SMILE. The American Dental Association (ADA) suggests that a child have his/her first visit to the dentist within six months of the appearance of the first tooth. Why so soon? Even if Charlie doesn’t have a full set of chompers, getting him accustomed to the dentist sooner than later will make subsequent visits much more manageable. Plus, your dentist will be able to give you all kinds of advice pertaining to your child’s individual dental needs. This is especially important when children are in their toddler and preschool years and they’re still trying to get the hang of how to properly brush and floss. For example, children under three only need a smidge of toothpaste (the size of a rice grain). Preschoolers only need a pea-sized amount of toothpaste on their brush. Children should routinely brush twice a day and floss once a day. It’s also important that kids learn to brush up and down—never side to side! Both young children and their parents enjoy the times when children are soothed by a “binky” or “paci.” By age three, however, sucking the thumb or soothing object can start to affect the way their teeth grow. If you can, begin the transition to wean them off the pacifier closer to age two. Whenever possible, try to find a children’s toothpaste designed specifically for children’s teeth care that includes fluoride. You can also look for the ADA seal of acceptance, as it’s only granted to toothpaste companies that have fluoride in their product. Do encourage your children to use child-appropriate toothbrushes—smaller size with soft bristles. 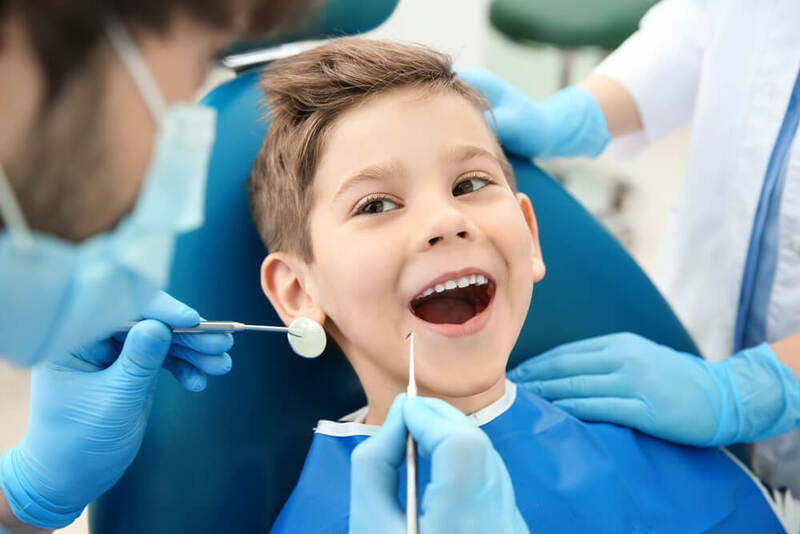 One of the best things you can do to promote positive children’s teeth care is to encourage your child to ask you questions and remain open about what happens during a first dental visit. Answer truthfully, but in a way your little one can understand, about why cavities are harmful or why it’s important to brush more than once a day. Dr. Mona Offers Much More Than Dental Care! Dr. Mona and the entire Kangaroo Smiles team do more than provide expert, compassionate and comprehensive dental care to your child. Both Kangaroo Smiles locations ensure that with every visit, parents and caregivers are given everything they’re needed to inspire children’s healthy dental habits to last a lifetime! And, no matter what age your child is—18 months to 18 years—Dr. Mona and our team are prepared to answer any questions or concerns you have regarding child dental care tips or oral hygiene instructions for children. 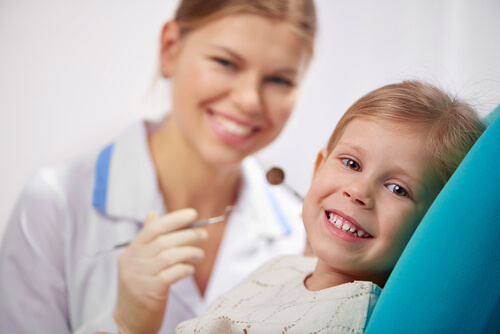 Kangaroo Smiles also offers a number of additional dental services for children, including protective sealants, pediatric crowns and much more. If you’re ready to set up a dental visit for your child, we’d love to hear from you. Call us today at (978) 425-1496.